Today is an exciting day with the launch of an unprecedented campaign, “Bridging the Gap,” where 100 Millennial and 100 Midlife Influencers are coming together to blur the boundaries as we believe we are stronger together. We are putting an end to the labels and divisions thatno longer serve us as age is simply a number, while it’s your attitudeand way of looking at life that truly matters. We are women supporting women, along with a few brave men joining in the celebration. We are coming together to send a powerful message that we choose to be seen for who we are rather than be defined by our ages. We believe in a world without separation. 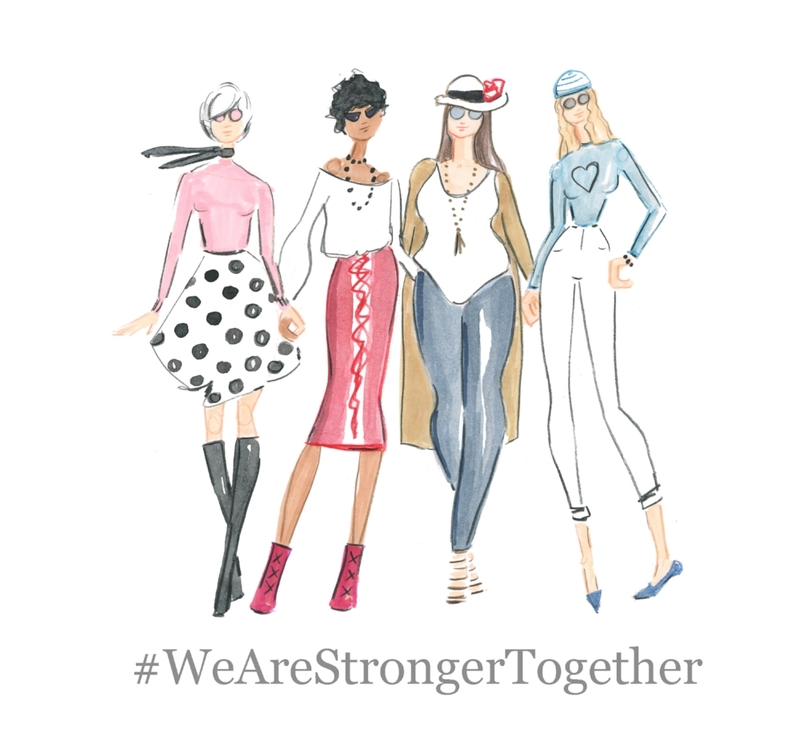 We believe that we are far stronger together. Please join us in this revolutionary campaign as it’s the hearts and souls of the women that truly matter in the end. I firmly believe that with age comes experience, and with experience comes wisdom. We Millennials have much to gain from looking to women who have lived a full life before us, and who are still thriving in this new age. Too often we forget the old saying, “respect your elders,” especially in a society that has created a negative connotation around aging women. But the truth is, those women we so often forget about have already walked a few miles in our shoes. As Catherine Grace, the founder of this campaign, has said, within every Millennial lies a future Midlifer to be. What better way to learn than from someone who has already done what you are doing or achieved what you are striving for, right now? That is why, more than ever, we must come together, both Millennial and Midlifer, to close the gap with respect, open-mindedness and love in our hearts to create an unbreakable bond and embrace one another. Being apart of this campaign is really special to me. While we are living in a world filled with opposition, divisiveness, Twitter wars and Facebook debates, this campaign literally “bridges the gap” between a group of people that are actually very similar to one another. Today and everyday after, lets quit being distant, unfriendly, and judgmental toward one another, and instead come together as one, empowering and lifting each other up every chance we get. For Midlife and Millennial women have more in common than meets the eye, and today I introduce you to my partner in this campaign, Sandra Smith, to prove why. Sandra is not only my mentor, but she is a dear friend as well. She is one of the most professional and inspiring business women I have ever worked with, with a tendency to over-deliver on everything she does. When I first met Sandra over a year ago, we chatted over coffee about our potential partnership regarding music (me the singer, her the manager), and I remember feeling instantly secure in her ability to enhance my life immeasurably. The experience this woman has and the wisdom she was willing to share with me is something I will always hold dear to me. I knew that we would have a great working relationship that has now turned into a solid friendship. The more I have had the pleasure of knowing her, the more I am impressed with her go-getter mentality. Sandra is a woman of her word, old-school if I may, yet so in touch with what is going on in the world and able to keep up with the ever-changing times. She has crushed the boundaries between the old ways and the new, and I have to say, I am very grateful to have her in my life. Sandra has worked in the music industry for over 30 years. She has worked with more talent and a few of my idols in the industry than you can imagine! Big names like Bon Jovi, Aaliyah, Brandy and Lil’ Kim just to name a few. Throughout her career she has helped sell over 10 million records and been apart of several Grammy nominations and wins. She has spent many years working with big name record labels such as Capitol Records, Motown Records and Atlantic Records. She is a woman who wears many hats. An entrepreneur, talent manager, fashionista, blogger, activist, mentor, mom, and friend to many. The list goes on. She is a force to be reckoned with in all areas of her life because she understands the importance of relationships, communication and respect. The thing that I love most about Sandra is that she is constantly learning. No matter her stage in life, she seems to always have a fresh perspective and a passion for life that is contagious to be around. She is always finding ways to stay relevant, relatable and ahead of the game. I am amazed by the power of her class and grace, and the strength she carries as a woman. I can truly say that I have learned and continue to learn so much from this woman. As a young professional trying to make it in this world, I am thankful for the example in Sandra and her life experience she shares with me through our friendship and business relationship. Let us all be inspired to bridge the gaps in our lives. I am so encouraged to be apart of something so necessary in our society today. We should be lifting our fellow females up, despite age differences, or any differences at all. Everyone has something special to offer, and I thank you Sandra for offering who you are to me. I hope it motivates others to do the same, because we are all #StrongerTogether.